Fully narrated tour by an experienced guide with comfortable vehicle that seats no more than 7 passengers. The tour begins with Ponderosa Pines of Flagstaff, past the dormant volcanoes of the San Francisco Peaks on our way to the South Entrance of the Grand Canyon. Discover the hidden secrets and breathtaking vistas of the Grand Canyon by exploring its interior. Our day-hike is a great way to experience the profound depth and wonder of the Grand Canyon with an extremely knowledgeable, experienced and certified guide. Our small group sizes ensure a fun, safe and intimate experience. Lunch is prepared by a Sedona restaurant and will be a wonderful picnic along the rim. After lunch, we have several options. For those that want to continue with some hiking, we will facilitate a scenic 3-mile rim walk. For the others that wish to do some sightseeing, we will tour the Grand Canyon Village, Lipan Point and Moran Point. Pickups at All Flagstaff hotels. Departure time is approximately 7:30AM from Flagstaff with pickups slightly before that depending on the specific guest hotel. Tour operator will contact guest the afternoon before for exact pickup time and answer any last minute questions. Lunch options will depend on the weather. If the weather is our typical sunny and wonderful one, we will enjoy a box lunch at the rim of the Grand Canyon. If the weather is a tad too cold or a tad too hot, we will seek the comfort of a restaurant at the Grand Canyon Village. You should wear comfortable multi-terrain or hiking shoes. This is NOT a good time to break in a new pair of shoes. A hat to keep your head protected from the sun, sunglasses, and sunscreen. It may be cool in the early morning or evening and can get very hot in the afternoons. A light shirt, shorts and a rain jacket are recommended in warmer months. It does rain in Arizona so you may also want to carry an umbrella. Light day packs are great for carrying everything you will need and for filling up with all of the wonderful souvenirs that you will find at the many gift shops. Of course, don't forget your camera with plenty of film or memory. 1. You must be able to hike a minimum of three miles. 2. You must be able to carry a minimum of 2 quarts of water. 3. You must be able to hike a 1000 foot elevation change. 4. You must be prepared for temperature extremes. This is a specialty tour and only departs on select days of the week, primarily Tuesdays, Wednesdays, and Thursdays but may operate other days for larger groups. Tour operator requires four passengers minimum to conduct tour. As we are concerned for guide and customer safety we reserve the right to cancel a tour in the event of hazardous weather. Our commitment is to keep in contact with the customer during these rare periods. Look and Save. We want you to do your research and find the Flagstaff tour that is right for you, but remember us to get the same tour for less. 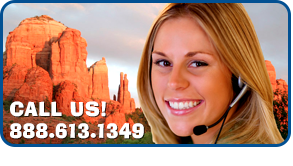 Please contact your travel specialist at Arizona Tour Deals immediately for our price match. Our Low Price Guarantee. In the event that you find a lower rate within 24 hours of booking with Arizona Tour Deals, we will credit or refund to you the difference. The Low Price Guarantee applies only to residents of the United States. Exclusions: The Price Match Program only applies to Flagstaff Tours and Flagstaff Activities. We apologize but Hotels and Restaurants change so frequently without notification that we are not able to apply our Low Price Guarantee Program.